Below is a list of the books that (had I not already read them) would be on my personal reading list this summer. These books have shaped my views and aspirations in many ways and have played a telling role in my success! I do encourage you to sit back and relax with one (or two) and enjoy, perhaps with a bracing spot of rose tea and honey. 1. Debrett’s A to Z of Modern Manners for the Young Witch or Wizard published by I Must Not Tell Lies Press. In my work as High Inquisitor at Hogwarts School of Witchcraft and Wizardry, I found a deplorable lack of etiquette in my pupils. This handy guide covers everything from speaking out of turn, to paying your superiors the respect they deserve. I recommend it to parents everywhere. For more information on my personal standards of good citizenship, read on at this link. 2. My Struggle by Gellert Grindelwald. This book was published in 1925, and although Gellert Grindelwald has had an unfortunate end, his early ideas were those of a true genius. While the word “eugenics” has recently come under attack by the politically correct, here Grindelwald’s views on eugenics as a way to strengthen society are as refreshing now as I’m sure they were back then. 3. Nature’s Nobility: A Wizarding Genealogy published by Toujours Pur Press. An unbiased account of how magical finesse is strongly influenced by genealogy. Some have labeled this as out of date considering the publication date of 1761, but I find the observations therein are quite as relevant as ever. 4. The Witch’s Desire by Ambrosius Moonflower – the tale of a headstrong witch tricked by a wicked plot and dangerous desires…. I must say when I need a moment to myself, after a busy day as Senior Undersecretary to the Minister of Magic, I find drinking a sweet cup of tea and perusing Mr. Moonflower’s novels quite the treat! 5. The A to Z of Corporal Punishment: A Comprehensive Guide to Dealing with Every Kind of Misdeed by Alecto Carrow and Amycus Carrow. In my capacity as High Inquisitor of Hogwarts School of Witchcraft and Wizardry, these tips came in very useful. The book was recommended to me by Hogwarts caretaker, Mr. Argus Filch. 6. Think Pink! : Interior Decoration for the Stylish Witch by Ferdinand Roseus. If there’s one thing all my friends know about me, it’s that I love pink! Roseus’s guide is an indispensable part of my life. His is the largest and most comprehensive collection of pink interior design and decorating ideas I have been able to find. His thoughts on settees, throw pillows, and doilies are particularly helpful whenever I need to set up a new office. Even more impressively, he doesn’t shy away from fuchsias or magentas! 7. Special Interrogation Plans – Case Studies in Intelligence Gathering from Azkaban published by Greater Good Books. This book details the interrogation techniques used by the Ministry during the First Wizarding War. It has only just been released by the Ministry of Magic Archives. The insights of our highly trained officials into preserving national security are as varied as they are comforting. 8. It’s Not All About Length by Sean Smallerstaff. Wand lore is always of particular interest to me, and this impartial study by Smallerstaff into the attributes of shorter wands is one of the few on the subject that I can read with equanimity. 9. The Plague of Lycanthropy: A Collection of Known Facts from the account of Jean-Francois Vaumesle d’Enneva compiled by William Wiggleswade. This is a cautionary tale regarding the evils of integrating lycanthropes into our society. The French town of Gévaudan suffered through a disaster in 1764 when a werewolf (who allegedly was appointed mayor by an ignorant wizarding populace) bit extraordinary numbers of people leading to high numbers of fatalities and soaring criminal activity. This event was so catastrophic even Muggles have noted The Beast of Gévaudan in their histories. The epilogue written by Wiggleswade is particularly enlightening and points to the potential dangers of the recent softening of laws concerning lycanthropes. 10. 365 Days of Kittens Desk Calendar published by 365 Days of Everything. Because everyone needs a kitten a day! 11. When Centaur and Merperson Numbers Balloon: A Study of Culling Techniques by Augustus Macnair. As Macnair rightly notes in his book, we must remember that although centaurs and merpeople look human, they are not and must be treated as such. The centaurs in the Forbidden Forest are particularly prolific and endanger the magical population, not only by potentially being spotted as their population increases but also due to their innate natures as bloodthirsty beasts, capable of massive harm to unarmed witches and wizards. Despite Macnair’s examination of a wide variety of techniques and their effectiveness, by the end of the book, it is clear there is one in particular that comes out on top. But I don’t want to spoil the surprise! For more of my thoughts on dangerous half-breeds, read on at this link. 12. 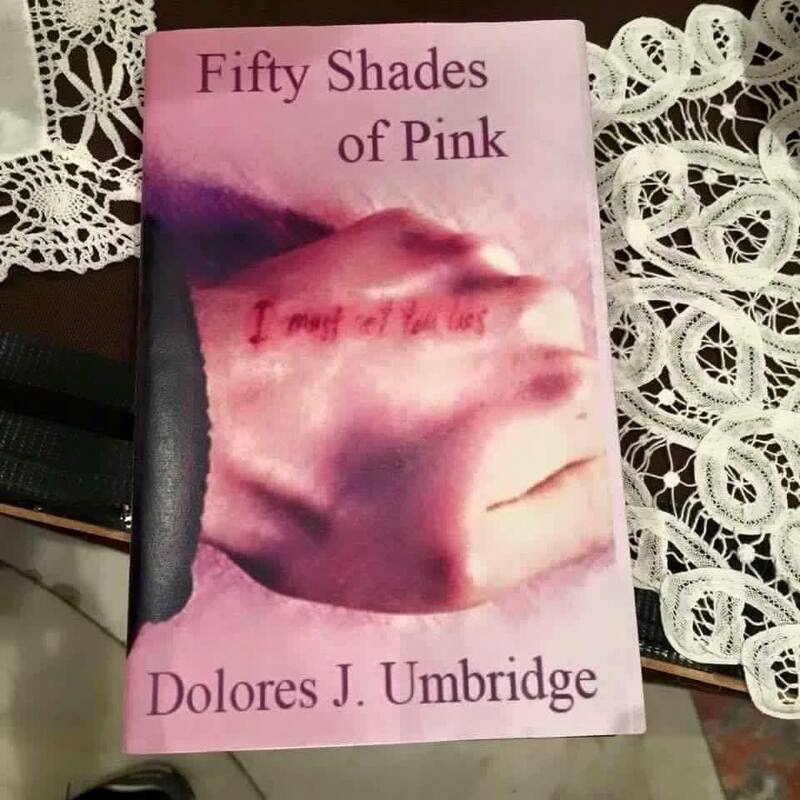 50 Shades of Pink by Dolores Umbridge. 50 Shades of Pink is my self-published autobiography, where I talk about my childhood in Oxford, my years at Hogwarts as a stellar pupil, and then my star-studded career at the Ministry of Magic. There are also wonderful tidbits along the way: my tips on how to collect kitten-embossed antiques, how to make the sweetest cup of tea, and charming your quill for all your writing needs. You can order any or all of these marvelous creations by Owl Order at Flourish and Blotts. December 29, 2005 – Harry Potter and the Half-Blood Prince is included on USA Today’s list of top books of 2005.